One day, Nigerians will wake up to the bitter reality that the publicized 'change' slogan or 'transformation' agenda are scams by Nigerians for Nigerians and in Nigeria. My perceived cynicism and generalization extends to the 29 registered political parties in Nigeria existing only or resuming from recess when the electioneering campaign is close majorly for self-recognition purposes and other accrued benefits. The face-off between the Speaker of Hon. Yakubu Dogara and his erstwhile ally, former Chairman House Committee on Appropriations; Abdulmumin Jibrin is a national shame. The revelations of the cultural act of padding in the National Assembly where federal lawmakers hit jackpots overnight by inserting fictitious projects into the national budget for successive years in the name of 'constituency projects' which they are never held accountable for. Enraged Abdulmumin Jibrin of Kiru/Bebeji Federal Constituency in Kano State has alleged that Yakubu Dogara who shares membership of the same political party with him - All Progressives Congress collaborated with 12 other floor members and principal officers (Deputy Speaker Yusuf Lasun, the House Whip, Alhassan Doguwa, and House Minority Leader, Leo Ogor) to pad the 2016 budget of change with a gargantuan amount in the tune of N284 billion including a personal request by Dogara to insert an ungodly sum of N30 billion which was the last straw that broke the camel's back. In the same vein, the dramatic whistleblower, Jibrin has been accused of using his office as the former Chairman House Committee on Appropriations to covertly divert projects worth N4.1 billion to his constituency, Kiru/Bebeji which culminated in his abrupt sack and an assumed reprisal attack on his principal, Dogara. A petition written by the anti-corruption unit of the National Youth Council, NYC to the Chairman of the Economic and Financial Crimes Commission, Ibrahim Magu also alleges Jibrin's budget padding past as in the 2014 national budget, while serving as House Committee chairman on Finance. Jibrin, 39 padded the budget with projects domiciled under the National Commission For Refugees Migrants and Internally Displaced Persons. The petition alleges that each of the 10 contracts was awarded to Kano State, but pointed out there was no location for the contracts; also no mention was made of the people who are going to benefit from the contracts, neither the name of the constituency for where the projects will be executed. While the truth of the matter seems difficult to ascertain in a political drama that appears like a coordinated grand plan of corruption that went awry and the principal was forced to sacrifice one of his key players whom he found expendable as a way of saving his face; it’s imperative to put one's ears on the ground and take note of the number of dirty linens being spread in the open by the warring parties to win public sympathy. The saintly Dogara who proudly flaunts his Christian faith has been alleged to have guest houses in Abuja with were furnished by fleecing the House of Reps of funds under the pretense of paying for guest houses and official residences. An area where his Deputy Speaker, Hon. Yusuf Lasun came in handy as alleged. Pictures of one of his guest houses at Vistula Close, along Panama Crescent, in the exquisite Maitama neighbourhood in Abuja were also leaked by some faceless lawmakers to back up the fraud allegations against the Bauchi native. Dogara who was also reported to have briefly completed a multi-million naira mansion in the highbrow area of Wuse II in abuja within his 6 months of Speakership has been further accused of intimidating multinational companies and administrators of government agencies for material inducements. The allegations of monumental fraud seem endless. 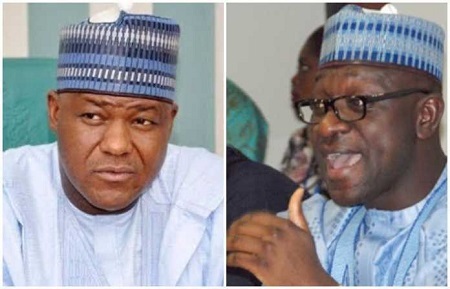 A plan to also impeach Dogara by the 360 House of Reps members was purportedly thwarted by an alleged distribution of the rare dollars in the tune of $25,000 to buy votes (signing of Vote of Confidence register) for the embattled Speaker as averred by the free-speaking Jibrin. Another disturbing part of the allegation is how Nigerian politicians display the needed unity devoid of primordial inclinations, faith and party differences in the face of corruption. The indicted parties belong to the so-called rival political parties namely APC and PDP constantly engaged in righteous cries, lip-service dedication to the masses, showmanship and political brickbats in the deceit of the vulnerable public. I smiled when I followed the messages on the official Twitter page of the PDP concerning the budget impasse as the opposition party smartly tried to address the issue of padding from an APC point of view alone in the tune of the usual blame game. History has proven to us that budget padding is almost as old as the about 17-year old democracy in Nigeria. Successive administrations right from the days of former President Olusegun Obasanjo, late Umaru Musa Yar'dua, Dr Goodluck Ebele Jonathan and then to the nepotism-stricken administration of the so-called anti-corruption warlord, President Muhammadu Buhari have been embroiled in dramatic budget padding furore involving the National Assembly since the year 2000 under OBJ. A former House of Reps member was invited to a current affairs talk show, Focus Nigeria on AIT being anchored by Gbenga Aruleba to speak on the dishonourable budget padding saga that has divided the green chambers into sycophantic groups acting in an aberration to the general interest of their constituencies. The young man swore that the issue of budget padding is the hidden goldmine in the National Assembly from which the lawmakers taking the place of miners illegally fetch ‘raw gold’. According to him, the act is a norm perpetrated actively by principal officers to enrich themselves and short-change the people. House of Reps lawmaker and member of the 'Transparency Group' in the person of Lawal Gumau who spoke on Sunrise Daily - another current affairs TV programme on Channels TV asserted that budget padding which has a legal outlook is like a yearly ritual in the National Assembly that causes a discomforting and acrimonious imbalance in budgetary allocations for constituency projects. This is a mockery of the National Assembly that gulps a large chunk of Nigeria's resources and also part of the indications of a failed system where government which is supposed to be the machinery of state to better the lives of the citizenry is turned into a quick money-business. The bitter truth is that we are far from the desired 'change' needed to take Nigeria to the Promised Land. The main problem lies in our institutions. The governmental structure is too weak and rotten. This is compounded by the orientation of Nigerians who see public positions as a gateway to amass wealth and power rather than to serve. The principles of accountability, responsibility and service have been abused by men of doubtful characters. Nigeria has been cursed with leaders who are capable of selling their followers for bread. A country filled with scavengers and opportunists ever ready to generate wealth from the problems of others. Our political structure is so weak and corrupt that any clean individual trying to change the system will either end up in the dirt or being ejected by the system which is a cesspool of fantastic corruption. I am cocksure that it was on this note that Bishop Mathew Hassan-Kukah of Catholic Diocese of Sokoto asserted that President Muhammadu Buhari was only fighting the symptoms of corruption and not corruption itself as the real corruption lies at the foundation of our political system. He said at a programme organised by the Book Readers’ Club of Ibadan School of Government and Public Policy (ISGPP) in Ibadan recently. The Nigerian constitution seems to be constituted to curtail the excesses of the poor alone. It’s appalling that the loud whistle being blown by Jibrin has fallen on the deaf ears of responsible agencies - Economic and Financial Crimes Commission and the Independent Corrupt Practices Commission, State Security Service and the Nigeria Police Force simply due to the calibre of people involved. The so-called crack teams with grounded fraud investigators have further confirmed the political conspiracy behind who is tagged 'corrupt' as they are probably waiting for a call from an 'Oga at the Top' to do their jobs. The Attorney General of the Federation and Minister of Justice, Abubakar Malami who is supposed to be the Chief Law Officer to the country has been unduly quiet. All I see here is a movement without a change in position; what an illusion. The daring Jibrin whose actions reek of his youthful nature made out time to tour the security agencies with written petitions but yet what we have gotten so far is a deafening silence even from the corruption intolerant Presidency. It’s crystal-clear that the APC leadership is weighing the political implications of probing the budget malaise that laughs at Buhari's publicised bid to sanitize the corruption-ridden Nigeria even at the expense of the economy. Jibrin has been banned from making further allegations in the media space the APC while the party tries to broker peace among all aggrieved parties. Dogara, on Friday the 5th of August ran to the Captain of the anti-corruption ship, Buhari for 'help' after which he boasted about not resigning as 'budget padding' isn't a crime probably after an assurance from the Presidency. This is another abuse of democratic principles the governing APC falsely represents. The parties involved are representatives of the people. This isn't a party affair but a public one. Public trust and funds are being abused here to comfort a few rich while over 110 million Nigerians continue to languish in penury (living below the $1.25 poverty benchmark daily) with our hopes of economic survival and redemption put in religious organizations constantly demanding for tithes and offerings from our incommensurate earnings. Nigeria has become too atrocious that the chances of success are so slim due to the absence of enabling grounds consequently by the actions of 'political sharks' that have turned their people into preys. At one point or the other this year, religious Nigerian masses have been forced by the economic squeeze to ask if God truly exists due to a long list of perceived unanswered prayer requests. But our God isn't a magician. Some powerful folks invested $2.1 billion of the arms deal funds in an election campaign while another imported refurbished cars to prosecute the Boko Haram war after securing an allocation for brand new products. They urged the Christians and Muslims to pray for the end of the rampaging sect but what happened after? Boko Haram grew in strength to the extent of issuing letters to military barracks in the north-east for the vacation of soldiers and other occupants. Our God considers due process too. Anybody who believes the revelations of the budget padding fracas will yield positive results by the prosecution and subsequent punishment of culpable parties can believe anything in his life. The APC has been engaged in a clandestine operation to call Jibrin and Dogara to order like it’s a husband-wife marital affair rather than testing the case in a competent court of law if for nothing but for the purpose of living up to the lousy 'change', setting good precedence for the younger generation and restoring the confidence of the people in the government of the day. Its more excruciatingly painful that the mutilated budget which was inflated to accommodate capital projects by Buhari to boost the economy of Nigeria will be heavily serviced by debts which is an indirect way of mortgaging the future of the country by an abrupt increase in the reported $60 billion debt profile which the Vice President, Professor Yemi Osinbajo lamented about hypocritically during the electioneering campaign. A sane government that means well for the people will use this juncture to undertake a constitutional reform of the budgetary processes and plug the lacuna exploited by politicians to amass wealth. In contrary, what happens is that all the whistleblowers making non-committal press statements end up having their mouth choked with juicy offers and their media partners also get their palms greased with wads of cash and immediately the case becomes history, inconclusive and unfounded. A report on BudgIT, a civic organisation for transparent leadership, reveals that only 33.3% of constituency projects slated in the 2015 national budget fought for tooth and nail by the National Assembly was achieved after the Federal Government allocated N40 billion for execution. That is an outright failure! Where did the funds go to? It’s high time we started checking the potbellies of our leaders for a hidden vault where cool cash maybe likely stashed away from the prying eyes of the public. I loathe sounding pessimistic but believe me, I doubt if we will ever get it right in Nigeria as the politicians are like football players belonging to a particular league like the English Premier League (United Kingdom), La Liga (Spain), Serie A (Italy) etc. These people in the name of change in values and defection also operate a perpetually open 'transfer window' that can even see someone decamp from a political party to the other on the day of an election for a 'fee' which is the guarantee of his selfish interests. It’s on this note that the former Governors, lawmakers, ministers and other leaders who tarnished the image of the PDP have joined the APC as 'born again politicians'. We keep recycling old wastes that are non-renewable and this accounts for the presence of tired and elderly men in the Senate 'chasing their dreams' during the plenary sessions when important issues are being deliberated on. The only time their Personal Assistants wake them from their slumber is when money is being tossed around. These misfits have destroyed the Nigerian society with their ill-gotten wealth. They have bought all institutions of integrity by luring proponents of goodwill with their next meal. They have bought religious institutions. They belong to the biggest Churches and Mosques with spiritual leaders having their mobile phone numbers on speed dial and mobilizing massive size of members behind them simply to secure their constant financial donations. What about the ethnic groups? They are now being mobilized alongside civil societies, pressure groups and even security agencies to defend the looters while a petty thief that hungrily grabbed a phone or a motorcycle is lynched publicly with blogs driving traffic with the gory pictures. Talented journalists are also bought to help launder the dirty images of these high-class kleptomaniacs with hyperbolic articles. What an ugly system! In conclusion, I hope Nigerians can be vigilant enough to make sure the Dogara-Jibrin rift is not swept under the carpet so that the ills can be exposed and the institutional flaws duly corrected to serve the people better. In a recessive economy like this, every naira must be accounted for and all parties no matter the class must bear the brunt of the hardship and sacrifice. The APC-led government should live up to the true change and not the predominant 'media change' we have seen in the last one year.